The production-ready KTM 790 Adventure R will make its world debut tomorrow at the EICMA 2018. The 790 Adventure R is a spiritual successor to the KTM 990 Adventure R.
KTM 790 Adventure R advanced prototype. In June, an advanced prototype of the 790 Adventure R was showcased to a group of owners at the KTM European Adventure Rally in Sardinia, Italy. The bike has been developed in collaboration with the KTM Factory Racing team alongside the Dakar-winning KTM 450 Rally bike. The KTM 790 Adventure R is powered by the same 799 cc, parallel-twin, LC8c engine, which also propels the KTM 790 Duke. However, the motor has been tuned differently to produce a broader torque curve for low-end and mid-range performance. While KTM hasn’t revealed the engine specifications, the motor produces 103.5 bhp of max power and 86 Nm of peak torque on the Duke. 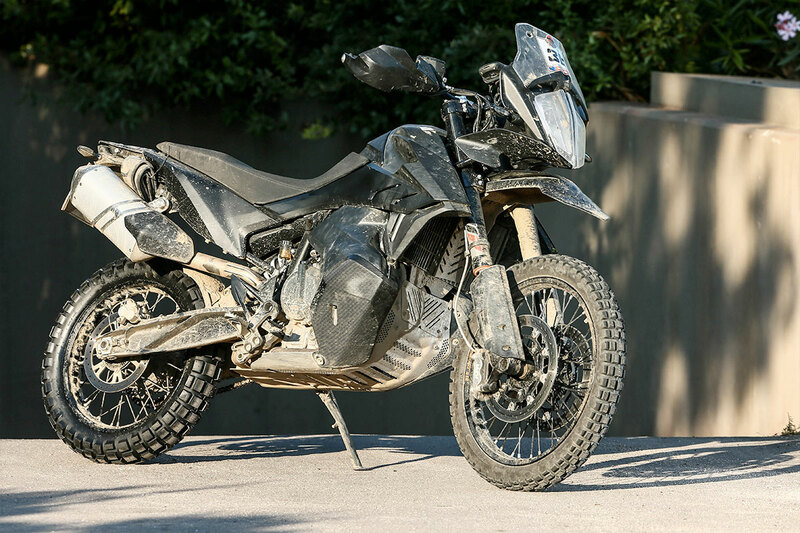 The KTM 790 Adventure R will come equipped with a host of electronic rider aids. These will include multi-level traction control system, cornering ABS, ride-by-wire throttle, and multiple riding modes among others. The ADV will also feature fully-adjustable WP long-travel suspension at the front and a rebound and compression damping-adjustable WP PDS mono-shock at the back. The KTM 790 Adventure R will feature adjustable foot pegs and handlebar, which can be attuned according to the rider. For better mass centralisation, high ground clearance and accessible saddle height, KTM have designed low-slung fuel tanks that are placed on either side of the engine. While the fuel tank capacity is not revealed, the bike has a riding range of over 400 km. The KTM 790 Adventure R will ride on 21-inch front and 18-inch rear wire-spoke wheels and knobby off-road tyres. Braking power will come from twin discs at the front with radial mounted 4-piston callipers and a single rotor at the rear with 2-piston callipers. The 790 Adventure R will go on sale in the global markets by early 2019. There’s no word on an Indian launch plan. However, if introduced, the 790 Adventure R will rival the Triumph Tiger 800 XCA, BMW F 850 GS and the Ducati Multistrada 950 Enduro. What we do know though, is that the company will launch the KTM 390 Adventure in India in 2019.